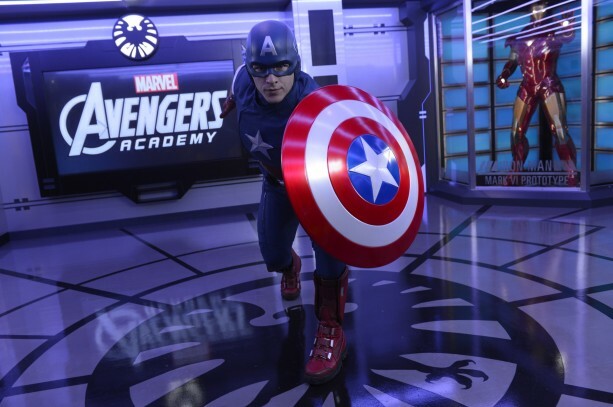 Marvel’s Avengers Academy is now accepting new recruits for training on-board the Disney Magic for a multi-day experience that transports kids to an elite facility for super hero training. Calling Disney’s Oceaneer Club its new seaward home, Marvel’s The Avengers make their presence known in an epic way. Young heroes are transported to a secret S.H.I.E.L.D. base (Strategic Homeland Intervention, Enforcement and Logistics Division)—a technologically advanced remote command post used by The Avengers for special missions and operations training. Throughout the base, displays featuring some of the equipment that helps to make The Avengers earth’s mightiest heroes—Iron Man’s high-tech suit of armor, Captain America’s shield and Thor’s hammer—inspire super hero “recruits” throughout their academy missions. Inside Marvel’s Avengers Academy, young hero hopefuls will get to virtually wear one of Iron Man’s suits during a simulated training experience on a video screen display. With a little help from J.A.R.V.I.S. (Just A Rather Very Intelligent System), the simulation gives recruits the opportunity to test out the suit’s repulsor system and flight mode—just like Iron Man. Trainees begin by virtually suiting up, piece-by-piece in the armor, and testing their agility in the suit. Then, recruits practice accuracy with the repulsor system blasting targets—this fully interactive experience is complete with lighting effects, immersing the young heroes in the experience. The training simulation concludes with a fast-paced flight test to get kids used to jetting around in the suit—a skill that they may find handy in the future. The fun continues with Become a Hero. When the kids enter the high-tech S.H.I.E.L.D. base at Marvel’s Avengers Academy, they are briefed by Director Nick Fury on the constant presence of fearsome villains—and the need to train new recruits to keep the world safe from evil. The kids learn that Hydra continues to be a nefarious force that The Avengers continue to battle all over the world. After Nick Fury signs off, kids are put to work building super-suits of their own by constructing masks, capes, chest plates and repulsor rays to reflect their own super powers. Once their hero suits are ready, the real work begins—skills training to learn telepathic powers and target practice with their repulsor rays. By the end of their first day, recruits are well on their way to active duty hero work when the training is interrupted by a surprise appearance of one of their favorite Marvel super heroes—Captain America himself. Checking-in on the training, Captain America teaches the group the “Avengers Assemble” call sign so they can truly step into the role of The Avengers. On Day Two of Marvel’s Avengers Academy, recruits report for more training of their super-skills, when S.H.I.E.L.D. intercepts an urgent transmission—Super-villain Red Skull has planned another elaborate diabolical plot to turn a “certain sea vessel” into a deadly weapon. With The Avengers on assignment on the other side of the globe, it becomes clear that it’s up to the newest recruits to formulate a plan to save the planet. Recruits realize the task may be harder than they thought when things take a turn for the worse—they soon find that their own Youth Activities counselors have been put under an evil spell that the kids must break. With time running out quickly, kids will need to use their super hero powers and creative reasoning to work together to find a solution to thwart Red Skull’s evil plans so that they can save the Avengers and prevent the Disney Magic from takeover. Disney’s Oceaneer Club, open to 3- to 12-year-old children, is a completely re-imagined area that transports little ones to the magical realms of brave super heroes, adventuresome toys, fanciful fairies and Mickey Mouse’s club for creativity and fun. This entry was posted in Cruises, Disney and tagged Disney Cruise Line, Disney Magic, Marvel's Avengers Academy on May 24, 2014 by siera.